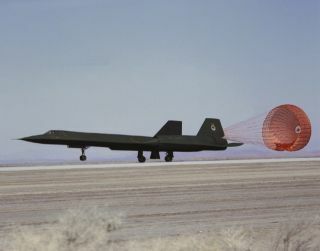 The SR-71, on loan from the U.S. Air Force, deploys its drag chute before its nose gear touches the runway after a research flight. In this historical photo from the U.S. space agency, one of two initial U.S. Air Force SR-71A reconnaissance aircraft that was retired from operational service and loaned to NASA for high-speed research programs arrives at NASA's Dryden Flight Research Center, Edwards, California in January of 1990. The aircraft deployed its drag chute even before its nose gear touches the runway at the end of a 1990 research flight. Dryden flew three YF-12 aircraft, prototypes of the triple-sonic SR-71s, in an earlier supersonic research program between 1969 and 1979.